The Ukrainian government has launched an investigation after the death of an American paramedic whose vehicle struck a landmine in the rebel-held east. The US citizen was working as a monitor for the Organization for Security and Co-operation in Europe (OSCE) when the mine exploded near a village controlled by pro-Russian separatists on Sunday. Two others were injured in the blast. The American was the first loss for the OSCE's mission in the three-year conflict. In the aftermath, Ukraine's government and the pro-Russian separatists traded accusations, while US Secretary of State Rex Tillerson has called for an investigation. Mr Tillerson told Ukrainian president Petro Poroshenko that Moscow's actions in the region were an obstacle to improved relations between the two countries. Kiev and the West both accuse Russia of backing the rebels in eastern Ukraine - an accusation the Kremlin denies. On Monday, Russian Foreign Minister Sergei Lavrov - speaking at a press conference alongside the European Union's foreign policy chief - said those behind the attack must be brought to justice. He also called for the investigation to be fast and thorough. The OSCE, which has 600 people in eastern Ukraine and is the only independent monitor in the region, said it would not release the names of Saturday's victims until their families had been notified, but did reveal the two people injured were from Germany and the Czech Republic. Kiev has said the attack, near the village of of Pryshyb in the self-declared Luhansk People's Republic, was an attempt by the rebels to scare the OSCE. But, on a website, the rebels said the vehicle had "deviated from the main route.... which is prohibited". 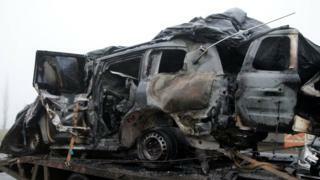 Luhansk rebel police force spokesman Alexander Mazeikin said the vehicle "hit an anti-tank mine". More than 10,000 people have died since Europe's only war broke out in April 2014.